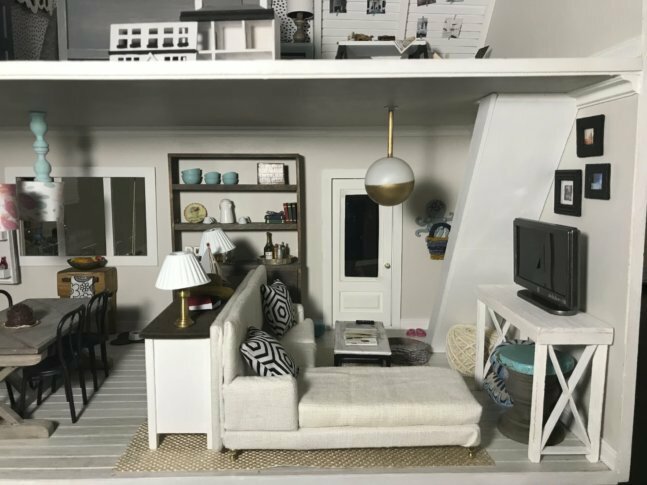 A growing community of dollhouse enthusiasts is sharing what they are creating on Instagram with the hashtags #dollhousereno or #moderndollhouse. In a story Oct. 2 about dollhouse design, The Associated Press referred incorrectly to the Iowa State Fair as having taken place this month. It was in August. For five months now, Reagan Baker has spent nights after work hanging curtain rods, assembling chandeliers and installing wood floors. She’s not renovating her New York City apartment, but outfitting a miniature dollhouse camper. Baker is part of a growing community of dollhouse hobbyists — mostly young women — who build, rehab and decorate miniature houses. Some work on dollhouses for their children and some, like Baker, just as a creative outlet. Many turn to Instagram — for instance #dollhousereno or #moderndollhouse — to share their progress and find inspiration. They are catered to by online shops specializing in accessories like miniature wall art, vintage furniture and tiny faux plants. These dollhouses aren’t the Victorian-era type — they tend to be filled with on-trend accessories like mini fiddle-leaf fig trees and wallpaper that looks like subway tile. That’s what sets today’s trend apart from previous generations’ efforts to create intricate period houses, said Stephanie Wallace, a dollhouse-furniture maker in Ballarat, Australia. Wallace, who owned an art gallery before the birth of her daughter three years ago, sees dollhouses as another expression of her love of design. Visiting an elaborate dollhouse replica of Buckingham Palace — complete with “teeny tiny Rolls-Royces and crown jewels” — on a trip to England a few years ago inspired her to return to a hobby of her childhood, when she played with the Victorian dollhouse her grandfather had made for her mother. She started posting pictures of her project on Instagram, and after a few weeks began getting messages asking her to make things for strangers around the world. She started an Etsy shop where she sells handmade peacock beds, velvet sofas and pedestal tables. Even with customers who have children, she said, “a lot of the things they buy for themselves.” And show them off on Instagram. Amy Dorman, who works in the insurance industry in Des Moines, Iowa, also found that encouragement online when she began working on a dollhouse project last summer. She built the house from a craft-store kit and has been making every piece of furniture by hand. Dorman’s miniature pink bungalow has a porch swing, farmhouse table and even its own wee dollhouse in the craft area, all shared on a dedicated Instagram account. “I get just like a child when I finish something and I take a picture of it, and I want to show all my friends at work and all my family,” Dorman said. In August, her dollhouse won a third-place ribbon at the Iowa State Fair, where there has been a dollhouse competition since 1980. The always popular event has seen an increase in entries the last two years. Now that the house is finished, Dorman said she’ll allow her 12-year-old twin stepdaughters to play with it, and she plans to build dollhouses for her young nieces in coming years. New York’s Baker is still perfecting her dollhouse camper — she’ll tackle making bedding and framed family photos next, before displaying it on her bookshelf. But like many dollhouse aficionados, she won’t be putting away her tweezers and glue.